Part of the Higgledy garden is converted from a lovely veg patch. In this little space we have sown some Calendula…these are the small plants to the left…sown in August last year and a little stunted by the very cold weather we had. 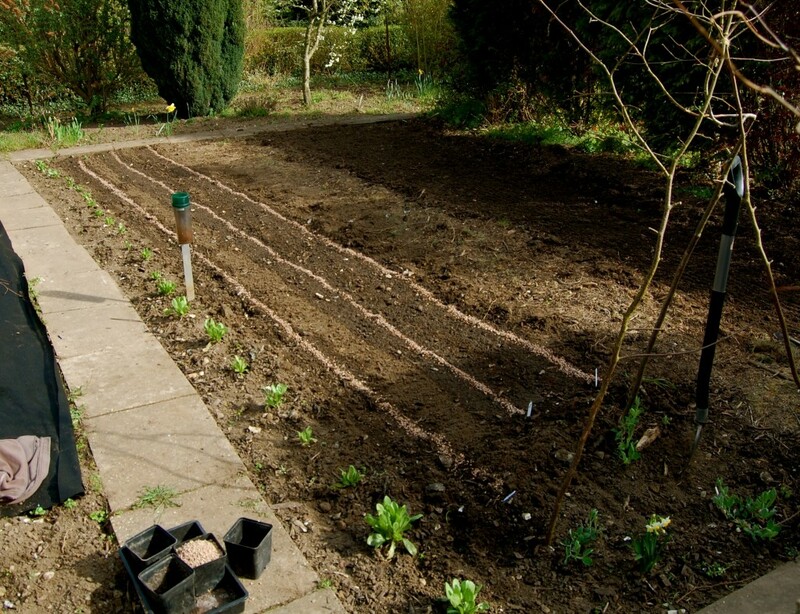 To the right of the calendula we have sown three lines of seed which we have marked with some grit so we know where to weed…as the pesky weeds come up FAR faster then the unpesky flowers. We have sown Godetia, Larkspur and…er…um…something else…hopefully Karen will remember and be able to set me straight. You can also see a few sweet peas beginning to climb a hazel structure. Note the tall hedge is on the south so this patch gets a little shade…Larkspur, Bells of Ireland, Cerinthe, Calendula, Lupins…can all take partial shade. The third genus was Clarkia, a nice reminder of my blooming childhood. There was something very Zen about laying those lines of grit. Shall we fashion another, with tiny hazel hurdles for racing the Higgledy tortoises, Flash and Gordon? The Large Lupin Cheese Grater. Some Germination Times. I would really love to grow your cut flower collection but I have a wee query! The only area I have available to grow the flowers would be in my polytunnel as I don’t have any other flat areas in the garden where our sheep can’t get access to!!! So the only option at the moment is the polytunnel! Just wanted to ask whether you thought they would all be ok growing undercover or d’you think conditions might get a bit hot and steamy for some?! (Although I should probably point out that we live on the west coast of Scotland!) Advice appreciated muchly! I think most of them would love it…a few may slow down in the heat of summer… calendula sometimes have a sulk if it gets too hot…snapdragons too (I don’t sell em anyway) and sweet peas aren’t too keen either…but it’s getting too late to sow those anyway. The calendula will recover when the weather cools off again.